The history of the Islamic west offers glorious pages of contribution to world history in various fields. This article presents a survey on some salient aspects of the role played by Morocco in the civilisation of Western Islam from the 11th to the 14th centuries. After a special focus on the role played by the Almoravids and the Almohads in the geopolitics of the Western Mediteranean region, the scientific scene of mathematics, applied astronomy and geography, is surveyed through the works of Ibn al-Banna, Al-Murrakushi, Al-Idrisi and Ibn Battuta. This article was published on www.MuslimHeritage.com in October 2004. It is republished with revisions and new illustrations. Copyright: © FSTC Limited, 2004-2010. Figure 1: Historical map of the Islamic west until 1100. Adapted from Atlas of Western Art History (New York, 1994, p. 87). (Source). There is plenty of writings on the role of Baghdad, Spain and Sicily in the rise of Islamic science and civilisation and its impact on the world. However, little is said or written about other places. Morocco is one such place. It had played a great part in elevating the human condition. Morocco's role was in fact decisive, for it was the principal route by which ideas and also people voyaged between East and West, especially as the Mediterranean became increasingly unsafe for Muslim travellers following the loss of Sicily by the Muslims (late 11th century). An illustration to highlight the role of Morocco as a transit zone is the example of paper manufacturing. This first started in the furthest eastern parts of the Islamic lands. Paper, originally, was brought by the Muslims from China. From a Chinese art, the Muslims developed it into a major industry . The first paper mill was built in Baghdad in the late 8th century and the early 9th century. Then, paper production, like much else, passed onto Syria on the way West. From Syria, it progressed further west to Palestine, then reached Egypt around 850. From Egypt it continued further to reach Morocco by the early 10th century, and then crossed into Spain in 950 . From Spain and Sicily, paper making spread to Italy and the rest of Europe . This is just one aspect of Morocco's role. Another is the close relationship between the Moroccan territories and the Andalus. Maghribi students, for instance, down to the 13th century, considered a stay in Cordova, Murcia, or Valencia necessary to finish their course . In fact, the period that extends from the end of the 8th to the end of the 11th century is characterised by the development, in both the Maghreb and Muslim Spain of two, more-or-less linked, scientific traditions encouraged by scholars who, "beyond the social contradictions and the differences of statute or of religion, were relatively united both by the way of life of the Islamic city and by the cultural and scientific environment that had been established favouring different human contributions and multiple contacts with the scientific foyers of the Muslim East ." Glick also explains how the economic links between Morocco and Muslim Spain were very close. The closest sphere of Andalusi commercial activities was North Africa, Morocco acting as both a source of raw materials (wood, alum, antimony) and finished cloth. In Morocco, Andalusi merchants sold their own finished cloth (Valencian brocade, according to Al-Shaqundî), and copper was a staple export . In particular, under the rule of the Almoravids and Almohads, who united Islamic Spain with the Maghrib, the great Moroccan cities, Marrakech and Fes especially, became extensions of the Andalusi urban economy. Merchants moved back and forth freely, carrying Spanish goods . Many businesses were family operations, and therefore members of the same family would be stationed in different countries to ease commercial arrangements. Glick mentions in particular Jewish families (who were very much involved in Muslim trade) who owned houses on either side of the Gibraltar strait . Morocco's main contribution to the history and geopolitics of the whole Islamic western region, however, was to provide two of its most powerful Muslim forces, which shaped history decisively: the Almoravids and Almohad dynasties. Figure 2: Map showing the extent of the Almoravid Empire around 1100 CE. (Source). Generally, when reading through historical literature, the image presented of the Almoravids and Almohads is very poor. For instance, in the famed film El-Cid, the Almoravids are portrayed as evil incarnate. Their leader Yusuf Ibn Tashfin, is darkened in deeds more than in skin; as cruel as much as he was ugly; his being and manners all oozing with malevolence and wickedness. His opponent the Cid is the reverse: handsome, kind, generous, merciful and courageous. In truth, El-Cid was a mercenary, bloodthirsty renegade, unfaithful to his word, who slaughtered the woman and robbed and slaughtered the orphan. He was a cruel, a violator of altars, says Lane Poole . The Almohads come out even worse than the Almoravids. Even authors usually displaying balanced judgements, describe the Almohads as being fanatical, orthodox, who harmed Muslim civilisation. "Fanatic barbarians, of the eleventh and twelfth centuries," Lea tells us. "The savage instincts of the Berbers were indulged by tortures and all the arts of the most exquisite cruelty. Whenever these barbarians encountered a monastery not one of the holy fathers was left alive. There was now visited upon the Christians a severe retaliation for the unspeakable horrors which they had been in the habit of inflicting upon their infidel adversaries in the name of the Gospel of Peace" . Figure 3: The Almohad territory (green) at its greatest extent around 1200 and its neighbouring states. (Source). Decades before the Almoravid intervention in 1086 in Spanish affairs, anarchy had spread in Muslim Spain as it disintegrated into thirty or so small feuding kingdoms (called the Taifas de Reyes). This chaos was exploited by their northern Christian neighbours to start the "Reconquista" . They saw their opportunity, and they made the most of it, observes Lane Poole . It culminated in a vast offensive, which resulted in the taking of the first major Muslim town Barbastro in 1065 by a combined army of papal, Norman, and Spanish forces. Many of the rulers of Taifas had thought their military alliance on the side of the Christian forces against fellow Muslims would save their realm; instead, they were conquered. A certain "monk of France", possibly Hugh of Cluny himself, had sent a letter to Muqtadir ibn Hud of Saragossa advising him to accept Christianity; a new more aggressive attitude towards the Muslims was taking shape . As the threat to their little kingdoms and principalities intensified, it became clear to these rulers, Lane Poole observes, that the Spaniards meant nothing less than re-conquest of all Spain . The Muslim populations also became painfully aware of the relative helplessness of their own princes, and acceding to pressures from below, the Taifa leaders were forced to appeal to the Almoravids in an attempt to stop the disintegration . In 1086, the Almoravids, tribesmen from the Moroccan south, crossed into Spain, and manoeuvring in masses to the sound of drums, they inflicted on their adversaries a shattering defeat at Zallaqa near Bajadoz . The Christian forces were awed and intimidated by the continuous drumming, which accompanied the swiftly executed manoeuvres of the Almoravid army . Ibn Tashfin slaughtered the Christian army and Alfonso barely escaped with some five hundred horsemen. Thousands of the best knights of Spain "lay stiff and nerveless on that fatal field ." Before the battle, Alfonso, as he looked upon his own splendid army exclaimed: "With men like these I would fight devils, angels, and ghosts! " The Almoravids were asked twice to intervene before being summoned to depart, their puritan faith hardly to the taste of the rather morally loose Andalusians. Some of the Taifa rulers even plotted to have Yusuf Ibn Tashfin, the Almoravid ruler, poisoned so as to rid themselves of an unwelcome guest . The third time he was invited, in 1090, Ibn Tashfin crossed the straigts of Gilbraltar from Morocco, removed the Taifa rulers and installed Almoravid rule over all the country. The Andalusian historian Al-Bakri, surrounded by the intellectual and material comforts of his country and his milieu, considered these puritans of Islam as enemies . He was not alone. The Castillans, concerned at this new conquering thrust, were "disconcerted by these veiled adversaries who charged on camel back to the sound of drums." As a result, the historical reputation of the Almoravids suffered from great prejudices . The Almoravid conquest, Wiet notes, was as Al-Bakri described it "a bloody holy war waged by fanatical disciples of a strange religion." They had conquered the whole of Morocco patiently, with the least effort. Their installation at Marrakech, their rapid expansion in southern Morocco, as revealed by excavations, emphasize the considerable degree of their cultural evolution, their faculty of assimilation and inventiveness, that of a people, whom Ibn Hawqal in the 10th century, just as Al-Bakri in the 11th century, wrongly regarded as little better than savages . The Almoravids also drew upon the African goldmines for minting coinage and secured great prosperity for the region. They were the first to achieve the unity of Spain and North West Africa, which had the greatest possible repercussions on economic affairs and also on cultural activities, even though the Almoravid Empire did not last very long . More importantly, the Almoravid intervention kept Spain in Muslim hands for another half century at least (that is until the end of their rule in 1147). They also halted the Castillan advance which, as it was going to do in the following centuries, was to progress further south into North Africa. So, in addition to saving the Muslim realm for this period of time, the Almoravids also allowed Muslim civilisation to prosper for an additional and lengthy period. Coming after them, the Almohads extended both Muslim political survival in the Andalus and the prosperity of Muslim civilisation until nearly the middle of the 13th century. Thus, the crucial role of these two Moroccan powers can be seen if one thinks of all the eminent names who lived under Almoravid and Almohad rule, such as the herbalists Al-Ghafiqi (d. 1165), author of Kitab al-adwiyata 'l-mufrada (The Book of Simple Drugs) and Ibn al-Baytar (1197-1248) of Malaga, the author of the largest pharmacological encyclopaedia that has survived to our time, the traveller Ibn Jubayr, the philosopher Ibn Rushd (1126-1198) and the astronomer Jabir Ibn Aflah (fl. middle of the 12th century). Figure 4: Introductory summary overview map from Al-Idrisi's 1154 world atlas, with the south at the top of the map. (Source). The Almoravids were at first great warriors, but soon after Ibn Tashfin's death, his kingdom succumbed to corruption and anarchy. A historian wrote about this situation: "They came to Spain hardy rough warriors, unused to ease or luxuries, delighting in feats of strength and prowess, filled with a fierce but simple zeal for their religion", says Lane Poole. The following generation, however, "lost their martial habits, their love for deeds of daring, their pleasure in enduring hardships in the brave way of war… In twenty years, in place of the former Berber army, now was a disorganised crowd of sodden debauchees, miserable poltroons, who had drunk and fooled away their manhood's vigour and become slaves to all appetites that make men cowards ." Soon Spain fell back into the usual chaos, the usual infighting between the various factions: Almoravid and Andalusian, Arab and Berber . Muslim Spain disintegrated into another multitude of warring city states just like those of decades before . These divisions were hardly lost on the combined Castillan forces, who resumed their assaults under the conduct of King Alfonso I of Aragon, named El-Batallador (The Fighter) because of his deep thrusts into Muslim territory , taking their towns and cities one after the other. At the taking of Lisbon, this time by an alliance of European armies, and following the tragic fate of the Muslim population once the city was retaken (1147), an English priest could not hold being moved by the fate of the Muslims: "We are inclined to feel pity for our enemies in their evil fortunes, and to feel sorry that the lashes of divine justice are not yet at an end ." The Almohads, another Berber dynasty from deep into Morocco, crossed into Spain, and again saved Muslim Spain, beating off Castillan armies further north. Then, on 18th July 1196, the Almohad ruler Abu Yusuf Ya'qub inflicted a crushing defeat on Alfonso VIII of Castile at Alarcos . So generous in victory was Abu Yusuf, he freed twenty thousand Christian prisoners without ransom . All Spain was at the mercy of Abu Yusuf, but he was obliged to cut short his operations to return to Africa, where a rebellion, sponsored and encouraged by Salah Eddin's successors, threatened him from the rear . Abu Yusuf quelled the rebellion, but by the time he returned to Spanish matters, his forces had been drained. Still, Spain, and North Africa were safe in Muslim hands. Abu Ya'qub , other than bringing peace and security in both Spain and North-West Africa, improved the irrigation systems and embellished the cities with fine buildings . In 1170-1171, he had made Seville his capital, and rebuilt the portion of the wall adjacent to the river, after a calamitous flood. The Alcazar, or citadel, originally built by Abd al- Rahman II, was restored, and there was also built the main mosque (1172-1176), of which only the minaret, now called the Giralda, still remains . The three hundred feet high Giralda in Seville was both a minaret and an observatory . When Seville was lost to Ferdinand III of Castile (1248), it boasted seventy-two mosques . In Morocco, Almohad rule coincided with a great period of prosperity and brilliance of learning. The Almohads built the Marrakech Kutubiya Mosque, which accommodated no less than 25,000 people, but was also famed for its books, manuscripts, libraries and book shops, which gave it its name . Abu Ya'qub, Deverdun says, "had a great soul and love for collecting books ." He founded a great library, which was eventually carried to the Casbah, and turned into a public library, under the management of the most erudite. Their service, says Ibn Farhun, was one of the privileged state positions, for which were selected only the best scholars . Some books in the library constituted part of the Almohad treasury, in fact, and were as prized as precious metals . There are, for instance, two copies of the Qur'an written in Mansub character that Salah Eddin had offered Abu Ya'qub . During the crusades, the Almohads had dispatched 180 vessels to help the Muslims fight the crusaders during the third crusade (which involved Salah Eddin against Richard the Lion Heart) in the east . Under the Almohads, the sovereigns did not just encourage the construction of schools and libraries, and sponsored scholars of every sort, but they even attended their scholars' funerals . Illustrious physicians also lived and worked in the Almohad court, especially under the third Caliph Abu Ya'qub and constituted a sort of corporation presided over by one amongst them . Ibn Rushd, Ibn Tufayl, Ibn Zuhr and many more philosophers and scholars found sanctuary and served the Almohad rulers . Contrary to the statements of accusers who talked of their enmity to learning, libraries thrived under their rule, including private libraries. Three main collections (all dating from the mid 13th century) can be cited: that of Ibn Tarawa, who was a great supporter of chroniclers, besides being a manuscript writer, and the collections of Al-Qaysi and of Ibn as-Suqr, the main librarian of the imperial library, whose private collection required five full camel loads to carry it . The Almohads checked Castillan advances in Andalus for a while, but soon afterwards, their rule was to suffer the same fate as their predecessors. On his death, the illustrious victor at Alarcos, Abu Yusuf Al-Mansur was succeeded by his son Al-Nasir (1199-1214), who was from a very different mould. Al-Nasir cared neither for science nor for religion, neglected government, and specialised in pleasure . At the very decisive battle of Navas de Tolosa, in 1212, Al-Nasir's much superior army was too disunited to face effectively a smaller but united Spanish army. Al-Nasir' army was crushed . This was the beginning of the end of Muslim Spain. One after the other, Muslim towns and cities fell: Cordova in 1236; Valencia in 1238; Seville in 1248. Only Granada was left in Muslim hands, to be taken in 1492. And there was no strong army from North Africa to hold back the Spanish advance. The local wars between the Spanish monarchies were some relief for the Muslims. By the time the Spaniards and Portuguese resumed their thrust into North Africa in the 15th century, the Ottomans were powerful enough and willing to come and lend a hand, and help keep the area under Islamic rule. Figure 5: Manuscript page of one of Al-Idrisi's books describing Finland (image in the public domain). Two famous Moroccan scholars, Al-Murrakushi and Ibn al-Banna, together addressed scientific subjects such as arithmetic, astronomy, geometry, algebra and chemistry and also history . Although Al-Murrakushi was not stricty speaking a Moroccan scholar, since his scientific career flourished in Egypt, his main contribution reflects the teaching and training he received in his native country. But Ibn al-Banna, a fully Moroccan scientist, was the leader of the most original scientific school in the late medieval Islamic west. Abd al-Wahid Al-Murrakushi was born in Marrakech in 1185; he studied there, in Fes, and after 1208 in Spain. In 1217, he went to Egypt where he seems to have spent the rest of his life. In 1224, he completed a history of the Almohad dynasty, preceded by a summary of Spanish history from the Muslim conquest to 1087 (Kitab al-mu'jib fi talkhis akhbar ahl al-Maghrib) . The text has been edited by R. P. A. Dozy . There is a French translation by Fagnan . Extracts can be found in Wustenfeld, Brockelman and Lévi Provençal . Hassan-al-Murrakushi's main scientific work is Jami' al-Mabadi' wa-'l-ghayat fi 'ilm al-miqat (The compendium of principles and results in the science of timekeeping), probably completed in 1229-1230. This is a very good compilation of practical knowledge on astronomical instruments, trigonometry and gnomonics . Part of this work has been translated by Sédillot . Sarton holds that the book was the most elaborate trigonometrical treatise of the Western caliphate, the best medieval treatise on practical astronomy, on gnomonics and the best explanation of graphical methods . The part dealing with gnomonics contained studies of dials traced on horizontal, cylindrical, conical and other surfaces for every latitude . Al-Murrakushi gave a table of sines for each half degree as well as tables of versed sines and arc sines (this last one he called the table of Al-Khwarizmi). To facilitate the use of gnomons, he added a table of arc cotangents . The second part of the book was devoted to the explanation of graphical methods of solving astronomical problems. In Al-Murrakushi's Jami' al-mabadi' the construction of planispheres, astrolabes, quadrants and the need of gnomonics are developed. This constituted the great interest of Sédillot who wrote one of the best accounts on Muslim astronomical instruments . In his treatise, Al-Murrakushi shows his good acquaintance with the mathematical and astronomical works of Al-Khwarizmi, Al-Farghani, Al-Battani, Abu 'l Wafa, Al-Biruni, Ibn Sina, Al-Zarqali and Jabir Ibn Aflah. For example, he shared Al-Zarqali's belief that the obliquity of the ecliptic oscillates between 23°,33' and 23°,53', a belief which tallied with the notion of the trepidation of the equinoxes . "The development of modern trigonometry dates from mathematical work done in Oxford and France in the fourteenth century in connection with astronomy ." Had Crombie even briefly consulted Al-Murrakushi, he would have realised just how far from the truth he was. Ibn al-Banna, whose full name was Abu 'l-Abbas Ahmad ibn Muhammad ibn Uthman al-Azdi, was born in 1256 in Marrakech . There is a claim that Ibn al-Banna was born in Grenada in Spain and moved to North Africa for his education. What is certain is that he spent most of his life in Morocco . This confusion on the place of his birth may be due to the fact that even after Almohad power had faded, the Moroccans – the Merinids in this instance – kept trying to save Muslim Spain. The Merinids had formerly lived in eastern Morocco before taking control of the whole country in 1269. They tried to help Granada to halt the Castillan advance through their country, and the strong link built between Granada and Morocco may account for the confusion as to which country Ibn al-Banna was a native of . Ibn al-Banna lived and taught for some time in Fes which became, after the fall of the Almohads, the capital of the Merinids, and which tried to rival, on an intellectual level, Marrakech, the only city which had had the privilege of having been, for almost two centuries (1062-1248), the capital of the entire Maghreb, including vast sub-Saharan zones . Ibn al-Banna studied geometry, fractional numbers and learnt much of the impressive contributions that the Muslims had made to mathematics over the preceding centuries . At the university in Fes, Ibn al-Banna taught all branches of mathematics, which at this time included arithmetic, algebra, geometry and astronomy. Many students studied under him in this thriving academic community . Ibn al-Banna wrote a large number of works, 82 are listed by Renaud, but not all are on mathematics . Other sources in fact state that he distinguished himself from his Maghribi predecessors by the richness and diversity of his output. Based on the inventory , made at the time by Ibn Haydur, Ibn al-Banna seems to be in fact the author of more than 100 titles, of which only 32 concern mathematics and astronomy, the others being dedicated to disciplines very distant from each other like linguistics, rhetoric, astrology, grammar and logic . The encyclopaedic character of the production of Ibn al-Banna may have contributed to his social status. Honoured by the Merinids, he left Marrakech in order to install himself for a time in Fes at the invitation of the sultan of the epoch . This eminent position, from which he benefited in the Merinid capital, reinforced the authority that he had already acquired through his scientific works. This double status, both scientific and social, may have helped him solve the problems that preoccupied his contemporaries, and which led him to publish an original book whose contents might be related, because of some of its aspects, to what Djebbar calls "ethnomathematics" . This work is Tanbih al-albab, the first part of which contains the precise mathematical answers to problems in everyday life, such as the composition of medicaments, the calculation of the drop of irrigation canals and the explanation of frauds linked to instruments of measurement . The second part belongs to the already ancient tradition of judicial and cultural mathematics and joins a collection of little arithmetical problems presented in the form of poetical riddles . In mathematics, Ibn al-Banna is credited with two major discoveries. He seems to have been the first to consider a fraction as a ratio between two numbers and he is the first to use the expression almanac (in Arabic al-manakh, meaning weather) in a work containing astronomical and meteorological data . His two books Talkhis a'mal al-hisab (Summary of arithmetical operations) and Raf' al-Hijab (Lifting of the veil), which is Ibn al-Banna's own commentary on the Talkhis, are his best writings in mathematics. It is in the latter text that Ibn al-Banna introduces some mathematical notation which has led certain authors to believe that algebraic symbolism was first developed in Islam by Ibn al-Banna and Al-Qalasadi . This matter is not agreed upon by all historians however. Many interesting mathematical ideas and results which appear in the Raf' al-Hijab, including continued fractions used to compute approximate square roots . Several well known geographers and travellers who left a noteworthy legacy also originated from Morocco. We mention Al-Idrisi and Ibn Battuta, who both came from northern Morocco. Figure 6a-b: Two examples of the Almohad architecture: the Giralda in Seville and the Kutubiya in Marrakech. (Source 1 - Source 2). Muhammad Al-Idrisi was born in Ceuta (Morocco) in 1099-1100 CE, and died in 1166 CE. He studied at Cordoba, and although he died in his birth place, Ceuta, he spent his working life at the Norman court of Palermo. At the age of 16, he travelled through Asia Minor, Morocco, Spain and the South of France and even visited England . His description of most of Western Europe is lively and, on the whole, quite accurate . The same is true of his treatment of the Balkans, whilst for the rest of Europe and for most of the Islamic world (with the exception of North Africa, with which he had a firsthand acquaintance) his account is based on the writings of others . Al-Idrisi was a noteworthy and original geographer. He used in a creative way the system of cylindrical projection of the Earth's surface, which was to be claimed some centuries later, in 1569, by the Flemish Gerard Mercator . Al-Idrisi's other merit, according to Udovitch is the extensive information he provides about contemporary Western Europe . Hitti also notes that Al-Idrisi's map places the sources of the Nile-supposedly discovered in the latter part of the 19th century in the equatorial highlands of Africa . At the court of Palermo, Al-Idrisi's patron was King Roger II for whom he wrote Al-Kitab al-Rujari (Roger's book) also known as Nuzhat al-mushtaq fi ikhtiraq al-afaq (Pleasures of Men and Delights of Souls), a book that has the scope of a large geographical encyclopaedia. This work is the most elaborate description of the world of medieval times, and for a considerable time thereafter. In the preface of the text, Al-Idrisi says that he spent fifteen years on his work . "Judging by the level of knowledge and the concept of critical research of his time," Ronart writes, "Idrisi's Rogerian Book must have ranked among the most prominent achievements in the history of geographical science ." Al-Idrisi also constructed a silver planisphere prepared with the utmost attention to scientific accuracy. This planisphere, Dunlop notes, has surely has been lost, melted down, but the book still stands as "a great monument of Arabic and Muslim geography" . Figure 7: View of the restored building of the Ben Youssef Madrasa in Marrakech founded in the 14th century by the Marinid Sultan Abu al-Hassan and allied to the neighbouring Ben Youssef Mosque. This madrasa was one of the largest theological colleges in North Africa and may have housed as many as 900 students. (Source). Ibn Battuta was born in Tangier on 24 February 1304 and died about 1368-9. He left his native Tangier on 14 January 1325 in order to make his pilgrimage to Mecca, but he only returned to Morocco almost a quarter of a century later, in November 1349 . Soon after his return to Morocco, Ibn Battuta left on a trip for Spain, and then turned south to visit the Mali Madinka state, especially the cities of Timbuktu and Gao. He returned to Morocco in 1354, and it is at this date that he dictated the story of his travels to Ibn Juzayy', a scholar at the court of Merinid Sultan Innan of Fes . Ibn Battuta's Rihla is an account of his travels first crossing many countries to India, where he occupied an important official function. Then he travelled by sea to China, Java and the Maldives. In modern scholarship, his travel account was translated into French by Defremey and Sanguinetty . There is also an abridged version by H.R. Gibb , who only translated selected extracts (thus the Arabic and French versions remaining more comprehensive and whole). The Rihla is very instructive for all the vegetation named and described within it, but also, as Rosenthal recognises, for its unique information on India in the 14th century, and even more so for the description of the Maldives, southern Russia and Black Africa . The merit of Gibb's version , which is used in the following to illustrate some of Ibn Battuta's descriptions of places he visited, is that it gives a very useful and lengthy introduction on Ibn Battuta's life, relating to his ascetic regime, resigning all his offices and giving away all his possessions at some stage, before he was urged into accepting office again by Sultan Muhammad and became his envoy at the head of an important mission to the most powerful ruler in the world then, the Emperor of China. "The Egyptian Nile surpasses all rivers of the earth in sweetness of taste, length of course and utility. No other river in the world can show such a continuous series of towns and villages along its banks, or a basin so intensely cultivated. Its course is from south to north, contrary to all other [great] rivers. One extraordinary thing about it is that it begins to rise in the extreme hot weather, at the time when rivers generally diminish and dry up, and begins to subside just when rivers begin to increase and overflow. The river Indus resembles it in this feature… Some distance below Cairo the Nile divides into three streams, none of which can be crossed except by boat, winter or summer. The inhabitants of every township have canals led off the Nile; these are filled when the river is in flood and carry the water over the fields ." The Turks, Ibn Battuta observes, leave their livestock free to graze without guardians or shepherds. This is due to their strict laws against theft. Anyone caught with a stolen horse is forced to restore it with nine others; if he cannot do this, his sons are taken instead . "I never returned to any of their cities after I had visited it a first time without finding my portrait and the portraits of my companions drawn on the walls and on sheets of paper exhibited in the bazaars… Each of us set to examining the other's portrait [and found that] the likeness was perfect in every respect….They had been observing us (in the palace) and drawing our portraits without our noticing it. This is a custom of theirs, I mean making portraits of all who pass through their country. In fact they have brought this to such perfection that if a stranger commits any offence that obliges him to flee from China, they send his portrait far and wide. A search is then made for him and where so ever the [person bearing a] resemblance to that portrait is found is arrested ." For briefer regional accounts on Ibn Battuta's travels, it is worth looking at M. Husain for India, Ceylon and the Maldives . For Africa, in English, there is G.S.P. Freeman-Greenville on the east African coast . Sarton's Introduction  includes useful shorter extracts. Also worth mentioning here also is a little known geographer of the Islamic west who stayed in Marrakech for part of his life. He is rightly noted by Sarton . Ali Ibn Musa Ibn Sa'id is a geographer, historian and the most important collector of poetry from al-Andalus in the 12th and 13th centuries. Ali ibn Musa ibn Sa'id al-Maghribi (1213-1286) was born at Alcalá la Real near Granada, grew up in Marrakesh, studied in Seville and lived in Tunis, Alexandria, Cairo, Jerusalem and Aleppo. He died in Tunis or Aleppo in 1275 or 1286. Being an indefatigable traveller, he was profoundly interested in geography. In 1250 he wrote Kitab bast al-ardh. His Kitab al-jagrfiya embodies the experience of his extensive travels in the Muslim world and the shores of the Indian Ocean. He also gives an account of parts of northern Europe including Iceland. Ibn Said also visited Armenia and was at the Court of Hulagu from 1256 to 1265. His Rayat al-mubarrizin wa-ghayat al-mumayyizin (Banners of the Champions, also translated as Pennants of the Champions), written in 1243, is his best known anthology of poetry. He also wrote a history of the Maghribi region (Book of the Maghrib). Ibn Sa'id's work, although containing much from his predecessors, also included new material, for example much information not given by Al-Idrisi. Ibn Sa'id had some knowledge of the Senegal River, and of the northern countries of Europe, including Iceland. He had travelled extensively throughout the Islamic world and his work was much used, and later corrected, by Abu 'l Fida in the following period . Finally, the name of Al-Marrakushi cited above should be added for his contribution in the field. He crossed southern Spain and all northern Africa down to Egypt, himself determining the coordinates of the principal towns and cities . Figure 8: The Madrasa al-Bu'naniya in Fes was founded in 1356. It is widely acknowledged as a marvel of Marinid architecture. The madrasa functioned at the same time as both an educational institute and a congregational mosque at the same time. It is the only madrasa in Fes which has a minaret. Opposite the main doorway of the madrasa is the entrance to the dar al-wudu (ablutions house). Left and right of the central court are class rooms. (Source). Marrakech was founded about 1070 by the Almoravids as the headquarters of their army north of the High Atlas, close to Aghmat, then a centre for trade across the mountains to the south. In 1147, Marrakech fell to the Almohads of the High Atlas who made it their own capital. Even when Seville was the capital of the Almohad territories, Marrakech was the centre of the Almohad community with its scholars and military. Marrakech became by the desire of its rulers the centre of attraction for Maghribi scholars and even for a certain number from Spain . So Ibn Rushd became engaged in astronomical observations in 1153 in Marrakech and was associated with the Almohad court. He had been introduced and recommended to Abu Ya'qub by the philosopher Ibn Tufayl (1105-1185), who was also based in the same city . Marrakech is renowned for the Kutubiya Mosque cited above, famed for its books, manuscripts, libraries and book shops, which gave it its name . The Kutubiya had a hundred or so librarians gathered in the shade of the minaret; and next to them there were many intermediaries who rushed between places searching for rare and new manuscripts to copy; and also the traders who bought and sold ancient works from and to the scholars of the city . The sultans themselves collected both works and their authors, whom they wanted to have very close to them . In Marrakech there was also a great tradition of constructors of astrolabes , and a good deal of detail on such figures and their accomplishments can be found in Mayer . Many historians flourished in Marrakech, most living surrounding the Caliphs. Abu Bakr al-Sanhadji who wrote extensively on the Almohads, and whose works were traced by Lévi Provençal to the Spanish collection at the Escurial. Because he observed from very close in time the events he describes, he is the most authentic voice on the Almohad movement in history . Another historian born in Marrakech in 1185, but who studied at Fes, was Abd al-Wahid al-Murrakushi . Towards 1224, he wrote his Kitab al-Mu'jib fi talkhis akhbar al-Maghrib which is a good personal account of the author's history of the Western Maghrib and where, of course, Marrakech has a leading place . "Abu Yusuf built a bimaristan in Marrakech, which I believe has no equal in the world. For this purpose he chose a very extensive area in the centre of the city. He ordered the masons and the builders to carry out his plans with the greatest perfection possible. He decorated the hospital with inscriptions and designs of surpassing beauty… He ordered that flowers should be planted and cultivated in the courtyard, as well as fruit trees, and to have flowing water conducted to all the wards and rooms. Of the sources of water one was paved with marble. He ordered the hospital to be equipped with furniture and to be covered with tapestries of wool, linen and silk, which gave an indescribable richness. He endowed it with ample waqfs and donations, providing the hospital with a daily sum of forty dinars for its expenses. Figure 9a-b: Views of the Qarawiyyin mosque and university in Fes: (a) from above and (b) glimpse of the courtyard. (Source). Pharmacists were employed to prepare food and drink and needed medicaments, as well as clothing for the summer and winter for the patients. When a poor patient left the hospital he was given a sum of money until he could find employment. When a rich patient was discharged he received his money and belongings beforehand. The hospital was accessible to rich and poor alike. If a stranger was taken ill in the city, he was admitted and treated until he was well or until he died. Every Friday the monarch rode to the hospital and visited the sick, asking about the state of their health and making inquiries about their needs. The caliph continued this custom until his death ." Fes is admirable in every respect. Browsing through Burckhardt  one is simply amazed by the uniqueness of the beauty of the city, the purity of colours, and all the expertise of Muslim art gathered in every edifice of the city, especially in its most renowned site, the Qarawwiyin mosque and university. There is an excellent outline on the founding of Fes by Lévi Provençal based on the account written by Ibn Zar' in Rawdh al-Qirtas . It seems two separate cities were founded in an interval of one year. The date of the foundation is from the early 9th century the work of the Idrisids . Fes soon received an influx of people of diverse origins; Arabs, Berbers, Jews, and also Andalusians from Cordoba who had just been severely repressed by the ruler Al-Hakam I . The city grew in size and in cultural importance. Available information shows that a strong scientific tradition was established in Fes, although more research is required to assert the full scale of this tradition, its links with that of the Andalus and the profile of the men of science who lived there . The Merinid princes made it the political capital, but also they were able to attract to this city a host of students from all parts of the country by the foundation of a series of colleges or madrassas around the Qarawiyyin mosque of New Fes . The city's greatest claim on the intellectual front is the renowned site of the Qarawiyyin mosque and university. Figure 10a-b: Two photos of the Al-Lija'i clepsydra located in the room of al-Muwaqqit (time keeper) in the minaret of the Al-Qarawiyyin mosque in Fes. The muwaqqit was the officer charged with the regulation and maintenance of the clocks and with communicating the correct times of prayer to the muezzin. The most important object of the Dar al-Muwaqqit is the water clock of Al-Lija'i made at the order of the Marinid Sultan Abu Salim Ali II (r. 1359-1361) by Abu Zaid Abdurrahman Ibn Suleyman al-Lija'i (d. 1370). Notice the 12 doors under and above the disk; the red wooden structure is the top part of the clock. Source: La clepsydre Al-Lijai. The first edifice of the Qarawiyyin was built, on the left bank of the Wadi Fas, in 245/859 and was the work of a pious woman, Fatima bint Muhammad al-Fihri, who came from Kayrawan to Fas with her family. She very probably received the authorization to build from the Amir Yahya b. Idris, grandson of Idris II. The first oratory measured on the inside 46.60 m. from east to west and 17.20 m. from north to south and included a prayer hall with four parallel bays in the kibla wall. The Idrisid bays are larger than those of later extensions (4.10 m. as against 3.70 m.) and contain 12 archways: 5 on the west of the axial nave and 6 on the east. There has been no success in finding the motive for this abnormal arrangement; perhaps it should be connected with the alteration suggested by the inscription of 263/877 , and whose author would be the amir Dawud, a grandson of Idris I. The eastern and western boundaries of the initial oratory are marked in the present monument by a line of cruciform pillars which separate it from the extension of the 6th/12th century. The court extended in front of the prayer hall. It was of meagre dimensions. So it is established, by its overall lay-out and its exterior, that this first mosque resembles the sanctuaries which were erected in the 3rd/11th century in the Maghrib al-Aksa and of which al-Bakri gives us information . Figure 11: Restoration of the Palace Bricha in the medina (old city) of Tetouan in northern Morocco. The medina of Tetouan was built by refugees who had been expelled from Spain after the Reconquest. It remains a largely untouched example of high Andalusian culture. (Source). At exactly what date can one speak of higher education of the Qarawiyyin? It is really difficult to answer this question with precision. The Moroccan historian the late Muhammad al-Manuni thinks that it is in the reign of the Almoravids that the University really became attached to the mosque ; but the Qarawiyyin was not the only place of worship where there was teaching. At any rate, for some time, the Qarawiyyin was one of the three or four schools of the city, before becoming the principal centre of higher learning in Morocco . It had a great impact on learning both around the Mediterranean and Europe. It is said that from the beginning of the 12th century and for centuries, the glory of the Qarawiyyyin consisted in its body of scholars (ulamas). Among the scholars who studied and taught there were Ibn Khaldun, Ibn al-Khatib, Al-Bitruji, Ibn Harazim, Ibn Maymun and Ibn Wazzan, the famous Leo Africanus . Al-Qarawiyyin was endowed principally by royal families and received students from all parts, near and far, from the Maghreb and the Sahara. Students lived in residential quadrangles, which contained two and three story buildings, accommodating between sixty and a hundred and fifty students, who all received a basic allowance for food and accommodation . At the Qarawiyyin, there were courses on grammar, rhetoric, logic, elements of mathematics and astronomy , and possibly history, geography and elements of chemistry . To gain an even better idea of such teaching, surely, consultation of the actual manuscripts is de rigeur, and some possible leads can be cited here . "It was during the reign of the Almohads", writes the chronicler, that, "in its richness and splendour Fes shone at its most magnificent. At that time, it was the most flourishing town in the Maghrib. In the reign of Al-Mansur and his followers, there were in Fes seven hundred and eighty five mosques and zawiyas. There are about 250 today; 240 places of convenience and purification, and 80 public fountains, which were all fed with water from springs and brooks. There were 93 public baths and 472 mills within and alongside the walls, not counting those outside the city." Amongst the most remarkable historical objects in the Maghrib are the clocks in Fes. One of these, a water-clock operated by levers and strings and without any complicated gear mechanisms, was located in a room in the minaret of the Qarawiyyin Mosque. It was made in 1286/87 by Ibn al-Habbak al-Tilimsani, and when it was restored in 1346-48 by Abu Abdallah al-'Arabi it was fitted with an astrolabic rete. Alas, the driving mechanism behind the clock is lost without trace, and it is not clear what changes have been made to the front of the clock. But fortunately the astrolabic part survives to this day. It is housed in a cabinet 2.4 metres high and 1.2 metres square; the rete is about 40 cm in diameter, and would have rotated once every 24 hours. It thus could imitate the apparent daily rotation of the heavens about the horizon of Fes, a kind of model of the universe in two dimensions. In addition, metal balls would fall through the doors above the clock every hour . Another water-clock was constructed in the 14th century next to the Abu 'Inaniyya Madrasa in Fes. Its maker was Abu 'l-Hasan Ibn Ali Ahmad al-Tilimsani, a muwaqqit at the Madrasa. It was a weight powered water clock. The date of its inauguration is on 6 may 1357. The clock itself has now disappeared but the basic device for announcing the hours –operating in a housing about 12 metres long– is still in situ overlooking a street in the medina. The clock consists of 12 windows and platforms - seven of which until now retained their brass bowls. Each hour the clock would eject metal balls which would roll through the device and fall through the little door appropriate to the hour in question onto a series of gongs. Thus the clock would chime every hour, and in between the hours one could tell the time by checking which door was open . The motion of the clock was presumably maintained by a kind of small cart which ran from left to right behind the twelve doors. The cart was at one end attached to a rope with a hanging weight, at the other end to a rope with a weight that floated on the surface of a water reservoir that was drained at a regular pace. Each hour one of the doors opened. At the same time a metal ball was dropped into one of the twelve brass bowls. The rafters sticking out of the building above the doors supported a small roof to shield the doors and bowls . The hydraulic clock of the college Abu 'Inaniyya was known as part of Dar al-Magana (clockhouse) which was built together with the madrasa. The Abu 'Inaniyya Madrasa in Fes, is a college founded in 1351-56 CE by the Marinid Sultan Abu Inan Faris who also founded a similar college in Meknes. It is widely acknowledged as a marvel of Marinid architecture. The madrasa functioned as both an educational institute and as a congregational mosque at the same time. It is the only madrasa in Fes which has a minaret . Figure 12 : Photo of the remains of Dar al-Magana (clock house) in Fez at the beginning of the 20th century. This is the clock standing next to the Abu 'Inaniyya Madrasa in Fez. From the twelve little doors metal balls were released into the brass bowls on the lower beams to signal the hours. The rafters on the top level used to support a small roof are now gone. (old image in the public domain). The model of the clocks built in Fes was known in the past, since the Antiquity and especially in the tradition of Islamic technology. The famous engineer Al-Jazari described their construction in the early 13th century, but the Fes clocks are the sole surviving Islamic examples. Such Islamic astrolabic clocks were not common even in the Middle Ages: we know of other examples only from Cairo, Damascus and Toledo, and there is a description of one in the 13th-century Andalusian astronomical compendium entitled Libros del saber de astronomia, compiled by order of King Alfonso X el Sabio. We are thus singularly fortunate to have some remains of two clocks in Fes, as well as details about their construction recorded by a contemporary historian (al-Jazna'i in his Zahrat al-âs) . This is only a brief sketch of the Moroccan contribution to Muslim civilisation. It is unfortunate that, although Morocco's heritage is the object of much admiration, few studies are devoted to it in English, especially in electronic form. The Moroccan contribution to Islamic civilisation, and to the history of the Islamic west in particular, is over shadowed by the intense interest shown by the scholarship to Islamic Spain, of which the history and influence are intimately connected to those of North Africa and of Morocco in particular. Entire spans of Morocco's scientific tradition, historical events, architecture and arts, education and teaching institutions, mechanics, and engineering, are still lacking. It is true, however, that several studies were published in the last decades in Arabic and French. There is a need to present them to the international community. We hope to be able to carry on this task and provide our readers with informative digests. Figure 13a-b: Two views of Hassân Tower in Rabat, the minaret of an incomplete mosque begun in 1195 CE during the Almohad reign. The tower was intended to be the largest minaret in the world along with the mosque, but its construction was stopped after the death of Ya'qub al-Mansour in 1199 CE. The tower only reached 44m, about half of its intended 86m height. The rest of the mosque was also left incomplete, with only the beginnings of several walls and 200 columns being constructed. The tower, made of red sandstone, along with the remains of the mosque and the modern Mausoleum of Mohammed V, forms an important historical and tourist complex in Rabat. The site of Hassân Tower in Rabat was added to the UNESCO World Heritage tentative list in July 1995 in the Cultural category. ( Source 1 – Source 2). R. Brunschvig, "Un aspect de la littérature historico-géographique de l'Islam". Mélanges Gaudefroy Demombynes, Le Caire, 1935-45. T. Burckhardt: "Fez City of Islam". The Islamic Text Society, Cambridge, 1992. C. Cahen: Orient et Occident au temps des Croisades. Aubier Montaigne, Paris, 1983. A. Cutler: "Who was the Monk of France and when did he write? ", Al-Andalus, XXVIII (1963), pp 249-269. A. C. Crombie: Science, Optics and Music in Medieval and Early Modern Thought. London: The Hambledon Press, 1990. T. K. Derry and T. I. Williams: A Short History of Technology. Clarendon Press, Oxford, 1960. G.Deverdun: Marrakech. Editions Techniques Nord Africaines, Rabat, 1959. A Djebbar: "Mathematics in the Medieval Maghrib", AMUCHMA-Newsletter, N° 15; Universidade Pedagógica (UP), Maputo (Mozambique), 15.9.1995. Republished 30 June 2008 on www.MuslimHeritage.com as Mathematics in the Medieval Maghrib: General Survey on Mathematical Activities in North Africa. D. M. Dunlop, "A Christian Mission to Muslim Spain in the eleventh century", Al-Andalus, XVII (1952). B. Dodge: Muslim Education in Medieval Times. The Middle East Institute, Washington D.C, 1962. W. Durant: The Age of Faith. Simon and Shuster, New York, 6th printing, 1950. G. S. P. Freeman-Greenville: The East African Coast. Oxford, 1962. T. Glick: Islamic and Christian Spain in the Early Middle Ages. Princeton University Press, Princeton, 1979. T. Glick: "Seville", in Dictionary of the Middle Ages, edited by Charles Coulston Gillispie Charles Scribner's Sons, New York, 1980-- , vol. 13. John Glubb: A Short History of the Arab Peoples. Hodder and Stoughton, 1969. P. K. Hitti: "America and the Arab Heritage", in The Arab Heritage, edited by N. A. Faris. Princeton University Press, 1944, pp. 1-24. M. Husain : The Rehla of Ibn Battuta. Baroda, 1953. D. Hunter: Papermaking: the History and Technique of an Ancient Craft. Pleiades Books, London, 1943. P. A. Jaubert: ,i.Géographie d'Edrisi. Paris, 1836-40, 2 vols. Ibn Battuta: Voyages d'Ibn Battuta. Arabic text accompanied by French translation by C. Defremery and B.R. Sanguinetti, preface and notes by Vincent Monteil, I-IV. Paris, 1968; reprint of the 1854 edition. Ibn Battuta: Travels in Asia and Africa. Translated and selected by Hamilton A. R. Gibb. Routledge , London, 1929. S. M. Imamudin: A Political History of Spain. Najmah and Sons Publishers, Dacca, 1961. T. B. Irving: "Dates, Names and Places: The end of Islamic Spain", Revue d'Histoire Maghrébine, No 61-62, 1991, pp. 77¬-93. A. Kettani: "Science and Technology in Islam: The Underlying Value System", in The Touch of Midas: Science, Values and Environment in Islam and the West, edited by Ziauddin Sardar. Manchester University Press, 1984, pp. 67-90. S. Lane-Poole: The Moors in Spain. Fisher Unwin, London, 1888. H. C. Lea: The Moriscos of Spain. Burt Franklin, New York, 1968. R. Landau: Morocco. Elek Books Ltd, London, 1967. Rom Landau, "The Karaouine at Fes", The Muslim World 48 (1958): pp. 104-12. R. Le Tourneau: Fes in the age of the Merinids. Translated from French by B. A. Clement. University of Oklahoma Press, 1961. Al-Murrakushi: Kitab al-Mu'jib. French translation: Histoire des Almohades by E. Fagnan. Algiers, 1893. A. L. Mayer: Islamic Astrolabists. Albert Kundig edition, Geneva, 1956. J. T. Monroe: "The Hispanic-Arabic World", in Americo Castro and the Meaning of Spanish Civilisation, edited by Jose Rubia Barcia. University of California Press, Berkeley, 1976, pp 69-90. J. J. O'Connor and E. F. Robertson: Arabic mathematics, a forgotten brilliance. G. Oman: "Al-Idrisi", The Encyclopaedia of Islam, 2nd edition. Leiden, Brill, 1971. J. Pedersen: The Arabic Book. Translated by Geoffrey French. Princeton University Press, 1984. E. Lévi Provençal: "Al-Maghrib", Encyclopaedia of Islam, 2nd edition, vol. 5, 1986, pp. 1208-9. E. Lévi Provençal: "La Fondation de Fès", in Islam d'Occident. Librairie Orientale et Américaine, Paris, 1948, pp. 1-32. Jean Read: The Moors in Spain and Portugal. Faber and Faber, London, 1974. S and N. Ronart: Concise Encyclopaedia of Arabic civilization, vol. 2: The Arab West. Djambatan, Amsterdam, 1966. C. A. Ronan: "The Arabian Science", The Cambridge Illustrated History of the World's Science. Cambridge University Press, Newness Books, 1983, pp 201-44. F. Rosenthal: "Ibn Battuta", Dictionary of Scientific Biography, edited by Charles Coulston Gillispie. Charles Scribner's Sons', New York, 1970, vol. 1, pp 516-7. G. Sarton: Introduction to the History of Science. The Carnegie Institute of Wiashington, 1927-48, 3 vols. ; vol 2. L. Sédillot: "Mémoire sur les instruments astronomique des Arabes", Mémoires de l'Académie Royale des Inscriptions et Belles Lettres de l'Institut de France 1: 1-229. Reprinted Frankfurt, 1985. S.P. Scott: History of the Moorish Empire. The Lippincoat Company, Philadelphia, 1904, vol. 1. M. M. Sibai: Mosque Libraries: An Historical Study. Mansell Publishing, London and New York, 1987. A.Thomson and M. A. Rahim: Islam in Andalus. Taha Publishers, 1996. G. Wiet et al. : History of Mankind, vol. 3: The Great Medieval Civilisations. Translated from the French. George Allen & Unwin/UNESCO, 1975. For more accounts on the growth of the industry see: J. Pedersen, The Arabic Book, translated by Geoffrey French, Princeton University Press, Princeton, 1984, and M. M. Sibai: Mosque Libraries: An Historical Study, Mansell Publishing Limited: London and New York, 1987. D. Hunter: Papermaking, The History and Technique of an Ancient Craft, Pleiades Books, London, 1943, p. 470. T. K. Derry and T. I. Williams, A Short History of Technology, Oxford Clarendon Press, 1960, p. 232; W. M. Watt, "L'influence de l'islam sur l'Europe médiévale", Revue d'Etudes Islamiques, vol. 40, p. 36. E. Lévi Provençal, "Al-Maghrib", Encyclopaedia of Islam, New edition, vol. 5, 1986, pp. 1208-9. J. G. Vernet and J. Samso, "Panorama de la ciencia andalusi en el siglo XI" [Overview of Andalusian science in the 11th century]. Actas de la Jornadas de cultura arabe e islamica, Insituto Hispano-Arabe de cultura, Madrid, 1981; quoted in Ahmed Djebbar, Mathematics in the Medieval Maghrib: General Survey on Mathematical Activities in North Africa; section 2. Birth and first developments of mathematical activities in the Maghrib (9th-11th centuries). Al-Shaqundi in T. Glick, Islamic and Christian Spain in the Early Middle Ages, Princeton N.J. Princeton University Press 1979, pp.130-1. T. Glick, Islamic and Christian Spain, op. cit., p. 131. S. Lane-Poole, The Moors in Spain, Fisher Unwin, London, 1888, p. 192. H. C. Lea, The Moriscos of Spain, Burt Franklin, New York, 1968 reprint, p. 1. See also S. P. Scott, History of the Moorish Empire, The Lippincoat Company, Philadelphia, 1904, vol. 1, p. 584. The so called "Almohad persecution" was particularly stressed by W. Durant, The Age of Faith, Simon and Shuster, New York, 6th printing, 1950, p. 395. C. Cahen, Orient et Occident au temps des Croisades, Aubier Montaigne, Paris, 1983, p. 21. S. Lane-Poole, The Moors, op. cit., pp. 176-7. See D. M. Dunlop, "A Christian Mission to Muslim Spain in the Eleventh Century", Al-Andalus, XVII (1952), pp. 259-310; Alan Cutler, "Who was the Monk of France and When Did he Write? ", Al-Andalus, XXVIII (1963), pp. 249-269. S. Lane-Poole, The Moors, op. cit., p. 178. J. T. Monroe, "The Hispanic-Arabic World", in Americo Castro and the Meaning of Spanish Civilisation, edited by Jose Rubia Barcia, University of California Press, Berkeley, 1976 pp. 69-90; p. 83. G. Wiet et al., History of Mankind, vol. 3: The Great Medieval Civilisations, translated from the French, George Allen & Unwin/UNESCO, 1975, p. 269. A. Thomson and M. A. Rahim, Islam in Andalus, Taha Publishers, revised edit., 1996, p. 90. S. Lane-Poole, The Moors in Spain, op. cit., p. 179. A. Thomson and M. A. Rahim, Islam in Andalus, op. cit., p. 92. G. Wiet et al., History of Mankind, vol. III, op. cit. ; p. 857. S. Lane-Poole, The Moors in Spain, op. cit., p. 183. A. Thomson and M.A. Rahim, Islam, op. cit., p. 97. S and N. Ronart, Concise Encyclopaedia of Arabic Civilization, vol. 2: The Arab West, Djambatan, Amsterdam, 1966, p. 89. Jean Read, The Moors in Spain and Portugal, Faber and Faber, London, 1974, p. 150. John Glubb, A Short History of the Arab Peoples, Hodder and Stoughton, 1969, p. 190. See also J. Read, The Moors in Spain and Portugal, op. cit., p. 165 and Al-Murrakushi, Kitab al-Mu'jib, French translation: Histoire des Almohades, Algiers, 1893. It is highly crucial here to make the difference between father and son with very close names: Abu Yaqub Yusuf ruled between 1163 and 1184, whilst his son, the victor at Alarcos, is Abu Yusuf Ya'qub al-Mansur; he ruled from 1184 to 1199. For easier identification, the father will be called Abu Ya'qub and his son Abu Yusuf. S.M. Imamudin, A Political History of Spain, Najmah and Sons Publishers, Dacca, 1961, p. 167. T. Glick, "Seville", in Dictionary of the Middle Ages, New York, Scribners, 1980 onwards, vol. 13, p. 213. S. M. Imamudin, A Political History, op. cit., p. 167. T.Glick, "Seville", op. cit., p. 213. R. Landau, Morocco, Elek Books, London, 1967, p. 80. G.Deverdun, Marrakech, Editions Techniques Nord Africaines, Rabat, 1959, p. 265. S.M. Imamudin, A Political History of Spain, op. cit., p. 168. G. Deverdun, Marrakech, op. cit., p. 261. R. Landau, Morocco, op. cit., p. 431. G. Deverdun, Marrakech, op. cit., p. 265. W. Durant, The Age of Faith, op. cit., p. 314. T. B. Irving, "Dates, Names and Places: The End of Islamic Spain", Revue d'Histoire Maghrébine, No 61-62, 1991, pp. 77-93; at p. 81. G. Sarton, Introduction to the History of Science, The Carnegie Institute of Washington, 1927-48, 3 vols., vol. 2, p. 681. R.P. A. Dozy, The History of the Almohads, Leiden, Brill, 1847, reedited 1881. French translation by Edmond Fagnan in Revue Africaine, vols. 36-37, separate edition Algiers, 1893. F. Wustenfeld, Geschichtschreiber der Araber, 1881; C. Brockelmann, Geschichte der Arabische Litterartur, 1898, vol. 1, p. 332; E. Lévi Provençal, Documents inédits d'histoire almohade, Paris, 1928. G. Sarton, Introduction, op. cit., vol. 2, p. 621. E. Lévi Provençal, "Al-Maghrib", op. cit. G. Sarton, Introduction, op. cit., vol. 2, p. 508. L. Sédillot, "Mémoire sur les instruments astronomique des arabes", Mémoires de l'Académie Royale des Inscriptions et des Belles Lettres de l'Institut de France, 1: 1-229; reprinted in Frankfurt, 1985. A.C. Crombie, Science, Optics and Music in Medieval and Early Modern Thought, The Hambledon Press, London, 1990, p. 86. J. J. O'Connor and E. F. Robertson, Arabic Mathematics, A Forgotten Brilliance?. A. Laroui, L'histoire du Maghreb, un essai de synthèse, Paris, Maspéro, 1970, pp. 147-85; quoted in A Djebbar, "Mathematics in Medieval Maghreb", AMUCHMA-Newsletter, N° 15, 1995; reedited in A. Djebbar Mathematics in the Medieval Maghrib: General Survey on Mathematical Activities in North Africa. J. J. O'Connor and E. F. Robertson, op. cit. A. Djebbar Mathematics in the Medieval Maghrib: General Survey on Mathematical Activities in North Africa. C. A. Ronan, "The Arabian Science", The Cambridge Illustrated History of the World's Science, Cambridge University press, Newness Books, 1983, pp. 201-244; p. 230. A.Udovitch, "Al-Idrisi", Dictionary of Middle Ages, Charles Scribner's Son, New York, vol. 6, p. 412 . A. Kettani, "Science and Technology in Islam: The Underlying Value System", The Touch of Midas: Science, Values and Environment in Islam and the West, edited by Ziauddin Sardar, Manchester University Press, 1984, pp. 67-90; p. 83. A.Udovitch, "Al-Idrisi", op. cit., p. 412. P. K. Hitti, "America and the Arab Heritage", The Arab Heritage, edited by N.A. Faris, Princeton University Press, 1944, pp. 1-24; p. 3. D. M. Dunlop, Arab Civilisation, op. cit., p. 171. S. and N. Ronart, Concise Encyclopaedia of Arabic Civilization, vol. 2: The Arab West, op. cit., p. 174. D. M. Dunlop, Arab Civilisation, op. cit., p. 171. See for more references on the work of Al-Idrisi the useful bibliography devoted to him at the conclusion of the article by G. Oman "Al-Idrisi", The Encyclopaedia of Islam, New edition, Leyden, Brill, 1971. The book of Al-Idrisi was translated into French by P. A. Jaubert, Géographie d'Edrisi, Paris, 1836-1840, 2 vols. F. Rosenthal, "Ibn Battuta", Dictionary of Scientific Biography, edited by Charles Coulston Gillispie, Charles Scribner's Sons, New York, 1970 ff, vol. 1, pp. 516-7; p. 516. Ibn Battuta, Voyages d'Ibn Battuta, Arabic text accompanied by French translation by C. Defremery and B.R. Sanguinetti, preface and notes by Vincent Monteil, I-IV, Paris, 1968, reprint of the 1854 edition. Ibn Battuta, Travels in Asia and Africa 1325-1354, translated and edited by H. A. R. Gibb, London: Broadway House, 1929. See also H. A. R. Gibb, trans, The Travels of Ibn Battuta, Cambridge, Hakluyt Society, 1971, 3 vols. F. Rosenthal, "Ibn Battuta", op. cit., p. 517. 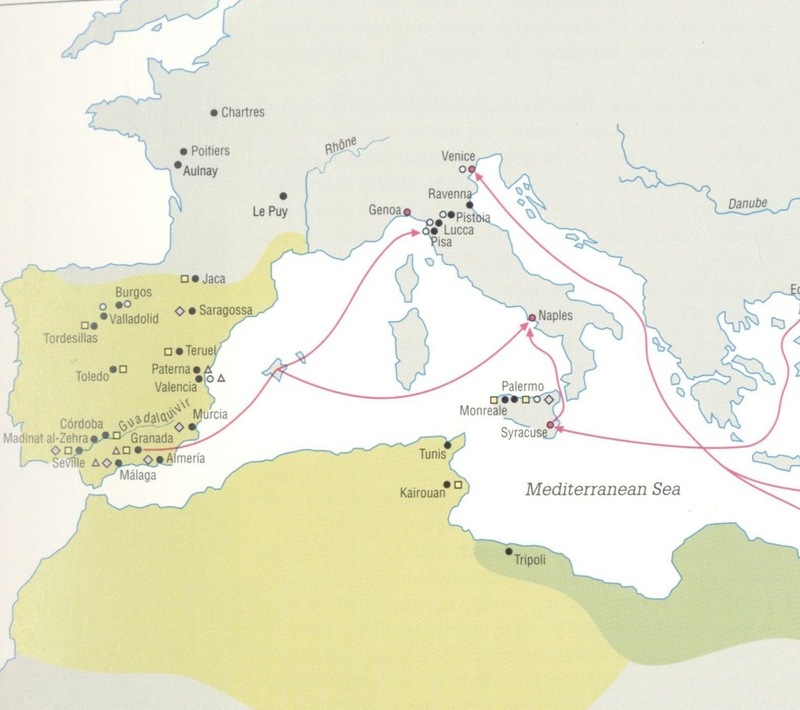 Ibn Battuta, The Travels of Ibn Battuta, transl. H.A.R. Gibb, op. cit. M. Husain, The Rehla of Ibn Battuta, Baroda, 1953. G. S. P. Freeman-Greenville, The East African Coast, Oxford, 1962. G. Sarton, Introduction, op. cit., vol. 3. G. Sarton, Introduction, op. cit., vol. II, p. 775. For more details on Ibn Sa'id and his works, see Ibn Said: Book of the Maghrib, 13th Century, Internet Medieval Source Book (Fordham University Center for Medieval Studies); M. Kropp, "Ali Ibn Musa Ibn Said al-Magribi und sein Werk al-Gusun al-yania fi mahasin shu'ara' al-mi'a as-sabi'a", Der Islam (Berlin), 1980, vol. 57, no1, pp. 68-96; James Bellamy and Patricia Steiner (editors and translators), The Banners of the Champions: An Anthology of Medieval Arabic Poetry from Andalusia and beyond by Ibn Said al-Maghribi (Madison: Hispanic Seminary of Medieval Studies, 1988). G. Deverdun, Marrakech, op. cit., p. 262. M. Brett, "Marrakech", op. cit., pp. 150-1. R. Landau, Morocco, op. cit., p. 80. G. Deverdun, Marrakech, op. cit., pp. 264-5. A. L. Mayer, Islamic Astrolabists, Albert Kundig edition, Geneva, 1956. G. Deverdun, Marrakech, op. cit., p. 263. R. Brunschvig, "Un aspect de la littérature historico-géographique de l'Islam", Mélanges Gaudefroy Demombynes, Le Caire, 1935-45. M. Brett, Marrakech, op. cit., p. 151. Abdel Wahid al-Murrakashi, The History of the Almohads, edited by R. Dozy, Leiden, 1881, p. 209. T. Burckhardt, Fez City of Islam, The Islamic Text Society, Cambridge, 1992, p. 73. E. Levi Provençal, "La Fondation de Fès", Annales d'Etudes Orientales de l'Université d'Alger, vol. 4, 1938, pp. 23-53; republished in E. Levi Provençal, "La Fondation de Fès", Islam d'Occident, Librairie Orientale et Américaine, Paris, 1948, pp. 1-32. E. Lévi Provençal, "La Fondation de Fès", Islam d'Occident, op. cit., pp. 3-4. A. Djebbar, Mathematics (online article), op. cit. G. Deverdun, "Al-Karawiyyin (masdjid)", Encyclopaedia of Islam, Second Edition. Brill, 2010 (consulted through Brill Online, John Rylands (Manchester University) subscription, 04 January 2010). See also H. Terrasse, La Mosquée al-Qarawiyyin à Fès, Paris 1968. M. Al-Manuni, "Tarikh al-Karawiyyin", in Djami'at al-Karawiyyin, al-Kitab al-dhahabi , Muhammadiyya 1379/1959. Bayard Dodge, Muslim Education in Medieval Times; The Middle East Institute, Washington D.C, 1962. Some second hand literature asserts that Gerber d'Aurillac (d. 1003), who later became Pope Sylvester II, and who introduced the Arabic numerals into Europe, studied in Al-Qarawiyyin: see Rom Landau, "The Karaouine at Fes", The Muslim World 48 (April 1958): pp. 104-12; p. 105. But as it was shown by modern scholarship this is just a legend. B. Dodge: Muslim Education, op. cit., p 27. R. Le Tourneau, Fes in the Age of the Merinids, translated from French by B.A. Clement, University of Oklahoma Press, 1961. For manuscrits see: E. Lévi Provençal: Les Manuscrips Arabes de Rabat, Paris, 1921; Muhammed al-Fasi: Al-Khizana al-ilmiyya bi Fas, Rabat, 1960; Bibliothèque et archives du Protectorat français au Maroc. Catalogue des manuscrits arabes de Rabat (Bibliothèque générale et archives du Protectorat français au Maroc, Deuxième série 1921-1953), publié par I.S. Allouche et A. Regragui. (Institut des hautes-études marocaines, t. 58). Paris, Librairie orientale et américaine, 1954. Rawd al-Qirtas, quoted in T. Burc. Abdelhadi Tazi, "Sa'a ma'iya tarji' ila al-qarn al-thamin al-hijri fi manar jami'at al-Qarawiyin bi-Fas" [A water clock dating back to the 8th century H in the minaret of the Qarawiyin university in Fez], Al-Bahth al-'ilmi (Rabat), n° 34, 1988, pp. 19-31. Dabid A. King: "On the History of Astronomy in the Medieval Maghrib", in Etudes d'Histoire des Sciences Arabes, textes réunis et présentés par Mohammed Abattouy, Casablanca: Publications de la Fondation du Roi Abdulaziz pour les sciences humaines et les études islamiques, 2007, p. 190-191; D.J. de Solla Price, "Mechanical Water Clocks of the XIVth Century in Fez, Morocco", Proceedings of the Tenth International Congress for the History of Science (Ithaca, N. Y., 1962), pp. 599-602. Rajae Tazi, L'horloge Hydraulique Bouanania, une énigme enfin perçue par des spécialistes du patrimoine, in Jeunes Du Maroc, Portail des Jeunes, December 16, 2004. Robert Hillenbrand, Islamic Architecture. NY: Columbia University Press, 1994, pp. 240-251; Hoag, John. 1987. Islamic Architecture. NY: Rizzoli, 57-59; Michell, George, ed. 1996. Architecture of the Islamic World. London: Thames & Hudson, 216; R. le Toureau, Fes in the Age of the Marinides, Oklahoma: Norman: 1961, pp. 120–7; Blair, Sheila S. ; Bloom, Jonathan M. The art and architecture of Islam, 1250 - 1800. New Haven and London : Yale University Press, 1994. pp. 122 – 123; Pickens et al. 1995. Maroc: Les Cites Imperiales. Paris: ACR Edition. Al-Jazna'i, Zahrat al-âs, ed. A. Bel, Algiers: Editions Jules Carbonel, 1923, pp. 38-39 (Arabic text) and pp. 92-93 (French translation). * The original article was produced by Salah Zaimeche, Salim Al-Hassani and Lamaan Ball. The members of the new FSTC Research Team have re-edited and revised this new version. The team now comprises of Mohammed Abattouy, Salim Al-Hassani, Mohammed El-Gomati, Salim Ayduz, Savas Konur, Cem Nizamoglu, Anne-Maria Brennan, Maurice Coles, Ian Fenn, Amar Nazir and Margaret Morris.